What's the number one prerequisite to building a high-quality wardrobe? Exactly: You need to be able to recognize a quality garment when you see one. You need to be able to tell the difference between a durable, well-crafted piece and one that looks pretty on the rack but won't last more than half a season. You need to know a) which properties distinguish high-quality garments from low-quality ones, and b) how to recognize these properties when you're out shopping. To help you do just that, this post and the next one will give you a broad introduction to assessing the quality of garments. We will start with fabrics in this first part and then cover seams, tailoring, linings and details like buttons, zippers and pockets in part II. I will also include a downloadable one-page cheat sheet that summarizes the most important facts in the second post. Most of this stuff is quite technical, so don't feel like you have to read through it all in one go. Instead, use these two posts like a resource that you can refer back to whenever you are planning to add a new piece to your wardrobe. Please also bear in mind that most of the points below are best practices, not hard facts. When I did my research for this post I came across lots of different opinions on the best type of seams, the right way to hem tailored skirts, the best type of denim, etc and did my best to summarize the key points in these two posts. If you are a sewing or textiles pro and have anything to add, feel free to share your tips in the comments. 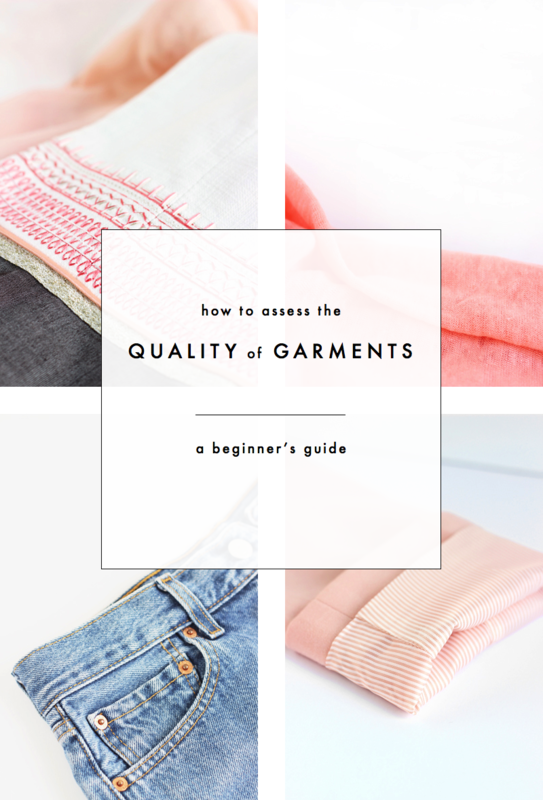 Before we get into all of the different criteria that you can use to assess the quality of a garment, let's go back to basics for a moment: What is quality? And, more specifically: What distinguishes a low-quality garment from a high-quality one? We want our clothes to be durable, to last more than a couple of seasons. We want sturdy clothes garments that we can move in without having to worry about ripping seams or popping buttons. We want our clothes to keep the same shape they had when we bought them, and to neither stretch out nor shrink over time. We want things that fit the shape of our body, not distort our silhouette or restrict our movements. We don't want fabric that pills or fades after wearing or washing it a couple of times. We want our clothes to feel good on the skin, so we can enjoy wearing them instead of taking them off as soon as we get home. And lastly, we also want our clothes to look like high-quality garments. A smooth fabric, neat seams, beautiful detailing. Not something that is about to fall apart. Whether a garment ticks these boxes or not depends on all of its different components and how they work together: the fabric, the seams, the lining, the tailoring and even smaller details like buttons and pockets. What distinguishes high-quality from low-quality manufacturers are the extra steps they took to make sure a garment not only looks the part now, but will continue to do so after multiple wears and washes, that it feels comfortable on the skin and is well-fitted. All of these 'extras' take time and money. That's why it's so easy to find pretty pieces at budget stores that end up falling apart after a week: To cut costs the manufacturer chose to focus on making the garment look good on the hanger instead of its quality, because that is what brings in the sales. Pretty much every shopper makes purchasing decision based on what a garment looks like, only very few will take the time to assess the seams, quality of tailoring etc. Now, what's important to note is that the quality and the price of an item are not always related. Some types of items are easier to manufacture and get right than others, which is why it is totally possible to find certain well-made items at affordable shops. At the same time, just because an item is very pricey, that sadly does not always mean that the manufacturer used all of that extra money to up the quality of the garment. So ... how can you make sure you are buying quality? My number one tip is to always look at the item in the flesh, i.e. not online. You might be able to decide whether you like an item visually just by seeing images, but to really assess its quality you need to be able to inspect it up close, to feel it, check the seams and try it on. In the following two posts I'll give you lots of pointers on what to look for when assessing a garment, but before you start, you should do one thing: set priorities. Not every single thing in your closet needs to last 20 years. Not every single sock you own needs to be made from merino wool. Going overboard is never practical so make sure you first decide on your general approach/strategy to quality. Decide which items you do want to invest a bit more time (and money) in and which you don't mind replacing after a couple of seasons. The hands-down most important component of a garment is its fabric. No matter how beautiful the details or how well-crafted the seams are, a garment made from a flimsy, scratchy or pilling fabric is never a good addition to any wardrobe. The first point is about figuring out how good the quality of the fabric is compared to other fabrics of that type, whether it is cotton, wool, denim, etc. This should be a pretty objective thing: There are certain properties that distinguish high-quality cottons from low-quality cottons, for example, and in this post you'll find a quick intro to the most important ones, for six popular fabric types. The second point is about deciding how well-suited the fabric is (regardless of quality) for that particular item, i.e. for the activities you plan on wearing it for, the weather, etc. Even the highest quality cashmere fabric won't be a good choice for active wear, just like you probably should not pick a delicate silk piece if you are looking for a warm, low-maintenance winter coat. This also relates to my next point: There are no inherently good or bad fabrics. Every type of fabric has its advantages and disadvantages (yes, even synthetic fabrics). The key is to become aware of them, so you can confidently pick the best fabric for the job at hand. Make sure the linen feels comfortable on the skin. Linen is not a soft garment by nature, but if it actually feels scratchy or rough, short/low-quality fibres were probably used which come with all the same disadvantages as short cotton fibres (see above). The one downside to linen is that it is not very elastic (therefore wrinkles easily) and will eventually break if it is constantly folded in the same spot. Before you buy make sure that the linen does not already contain any small ‘permanent’ creases. These are likely a sign for a cut that creates strong natural folds/creases when you move and these will only become more pronounced with regular wear. Also, think about whether the item will still look at least ok when it’s a little wrinkled at the end of the day. Do not worry about slubs, i.e. tiny, random knots along the yarn of the linen. These are almost always intentionally included in order to keep the integrity of the fibres intact and also add that special ‘natural linen’ texture. It’s also fine if there are no slubs: Very fine linen is usually slub-free because it was created from a super fine thread made from fibres of a consistent diameter. If you are looking for a good compromise between durability, coolness and softness, try a fabric composition of linen and cotton. The mix makes for a durable, yet much softer fabric that, compared to pure linen, wrinkles less and is a lot less high maintenance. First of all, check for any manufacturing faults: The knitting should be consistent and there should not be any knots, loose strands, holes or gaps between the individual threads of the fabric. One reason for fibre breakage when it comes to wool is that the animal the fibre came from was stressed or malnourished, resulting in a weak or brittle fibre. 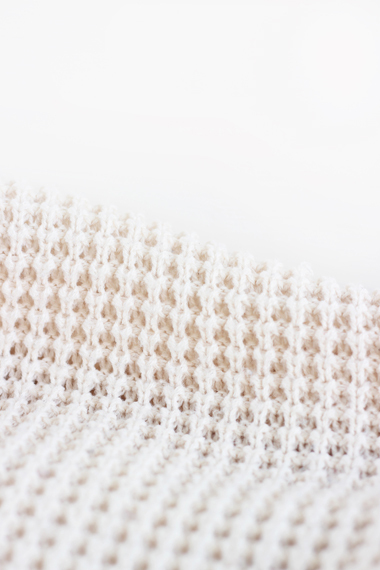 If you can already see broken fibres on a new garment, chances are they would only multiply with regular wear. Pilling is created when individual fibres come loose and eventually curl up into tiny balls. Wool pills easily, although higher-quality variants will be more tightly woven to prevent fibres from becoming loose in the first place. If you want a wool item that pills as little as possible, choose one with a very dense, finely knitted material. And: If there aren’t any pills on the garment when you try it on (not even on the collar, cuffs or inner thighs), the item gets a major thumbs up. Brands that use high-quality wool fabric will usually let you know exactly which type of wool it is. For example, merino wool is a particularly popular type known for its soft, super fine fibres. Unless it's a part of the design of an item, you should generally not be able to see through the weave. A high-quality wool garment will be tightly woven and dense, without any gaps in between the individual threads. In general, fabric made from fine wool fibres will be softer than thicker fibres, however, depending on the item you are looking for, you may prefer a sturdier, coarser type of fabric, even if it is a little scratchy (for outerwear for example). Before you buy a wool item, make sure you test what it feels like, not just on your hands but also on places where your skin is more sensitive, like the inside of your arm, to make sure you like it. Also note that some types of wools are naturally softer than others, e.g. cashmere is much softer than mohair, so the softness of a wool item does not necessarily speak for its quality. The quality of denim depends mainly on the quality of the cotton used to create it and how it was woven. Another important property is the stitching on the item (that is not technically a fabric property, but since it’s very denim-specific I want to mention some points about that here). The wash of the final piece is what really tends to drive the price of denim up, but that is not so much a question of quality, but of added labour/production costs. Denim made from high-quality cotton feels soft and even like it's a little moist. Denim should never feel thin and flimsy or so stiff and heavy that you can’t move (unless it is a raw, unwashed piece), but anything in between is fine and a matter of personal choice. If you want to go for a thinner fabric, make sure the yarns are tightly woven and the fabric feels strong and dense, so it won’t tear easily. When you are buying denim second-hand, always check the inner thighs for rubbing. Heavily rubbed thighs is a definite sign that the denim is not the best quality. Since denim is a very heavy fabric, strong seams that won’t split or unravel under stress, are super important. As a first step, try stretching the denim piece at different places along the seams. If the threads of the seams pull apart: not so good . Then, check the stitching. High-quality denim manufacturers will usually use either double-stitching (two rows of stitching next to each other) or chain-stitching (looped stitches that look like links of chain). As long as the thread is very thick, a single row of stitches is also ok, but make sure you do the stretching test in that case. Another way to assess the quality of a pair of denim jeans is to look at how the side seams were done. The cheapest, easiest way is to sew the two pieces of fabric together, then cut off the excess. This method leaves a bump along the inner side of your leg. High-quality manufacturers instead take the extra step to first sew the edges of each side, before they sew them together and press the seam flat for a super streamlined outline. A major downside of leather is that it can be permanently creased. When you buy a new piece, make sure it does not already have any scratch marks. On unworn pieces those usually signify that the leather is either brittle or very high maintenance. Check how the individual pieces of leather are attached. Were they sewn together or glued? Stitching takes longer than gluing and is therefore more expensive for brands, but it creates a stronger hold between the pieces. Any visible remains of glue are a definite no-go. A great alternative to real leather is faux (or vegan) leather, which usually consists of a polyurethane coating on a fibrous layer. High-quality faux leather can be just as durable as real leather, is generally more affordable, easier to maintain, won’t lighten as much in the sun - and doesn’t involve the death of animals. Just like real leather, faux leather should feel as supple as possible, not have any obvious scratch marks and the individual parts of the item should be sewn, rather than glued together. Low-quality faux leather will often have an obvious plastik-y, shiny look to it, higher quality pieces are almost indistinguishable from animal leather, at least to non-experts. So: Avoid shiny, go for soft and supple and, when in doubt, thicker tends to be better. Faux leather can be lightweight, but it should never feel thin or flimsy. 2.7 SYNTHETICS: IS NATURAL ALWAYS BETTER? For starters, there is a huge difference between synthetic materials (usually polyester or viscose) that are commonly used by budget fashion brands and the high-quality synthetic materials used by designers or higher-quality brands. In the fast fashion industry, synthetic materials are often used to replace natural fibres. It’s about cutting costs, so these types of synthetic fibres typically won’t have a high quality and are mainly chosen for their resemblance to natural materials, their price or their look. On the other end of the spectrum there is the designer who chooses a synthetic material over a natural one for its specific properties (e.g. it’s particularly light weight, the way it drapes, its texture), in order to enhance the final garment. Many designers and brands specifically formulate fabrics to get the exact type that’s right for their design or to improve things like breathability and other functional properties. Oftentimes, a small amount of synthetic fibres improves the fit of an otherwise natural fabric. Spandex, polyester or lycra especially mix well with cottons or wools to add stretch and elasticity, and make sure the garment keeps its shape after washing. For fitted items that you want to curve around your body (e.g. jeans or t-shirts) look for a fabric composition that includes about 2 to 5% of a stretchy synthetic material. Synthetic fibres are often the best choice for active wear because they are lightweight, super stretchy (and therefore form-fitting without being restricting), dry fast or are able to transfer sweat away from the skin. Of course, there is a huge amount of synthetic fabrics available, all of which have different properties and uses, and some of which are more valuable than others. One type I want to highlight here is rayon which is, by most accounts, a particularly good choice when it comes to synthetics (or rather semi-synthetics, because it has a natural base). Rayon is a breathable cellulose fabric that is made from wood pulp (as opposed to plastic), is biodegradable and can mimic the feel of smooth cotton, silk or linen. Many people consider modal to be the best type of rayon: It is made from beech trees, is super smooth, water absorbent and resists shrinking. You’ll often find it mixed in with cotton. 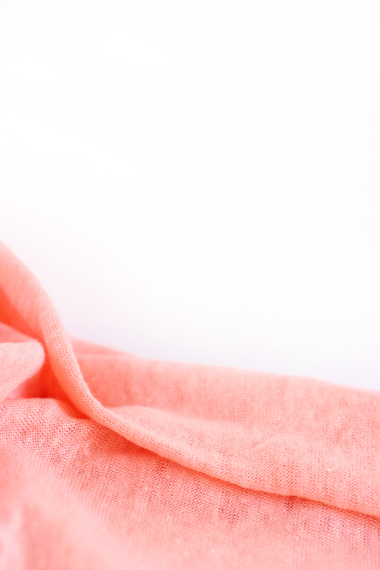 Another popular type of rayon is tencel, which is also very soft, easy to maintain and wrinkle resistant.